If there's one thing the nerd community hates, it's locked bootloaders. They make installing custom ROMs or second operating systems impossible, and that's just not cool. But when it comes to phones, we have carriers to thank for restrictions, not just OEMs. Over at Droid Life, a reader has submitted a letter they received from Verizon (below) in response to a complaint outlining that the company wasn't allowed to lock the bootloaders of phones. OK, so that complaint may not be entirely correct—private companies are kinda within their rights to do this kind of thing—but the response is interesting. The general message is that Verizon openly demand that OEMs lock bootloaders, they claim in an attempt to reach a "standard of excellence in customer service" that they have set. 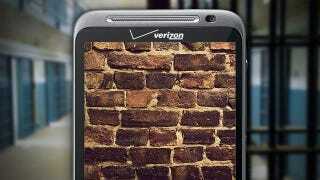 Through some interesting logic, they feel that being able to unlock phones could simultaneously worsen the Verizon experience for both those who do and do not choose to unlock. Hmmm. While they admit to not wanting unofficial software using their network, they never once suggest it's down to security concerns, which seems a little weird. Essentially, they want to provide an optimal solution for "for as many customers as possible". While that makes perfect business sense, it does leave a large group of disgruntled nerds in the cold—something they don't seem too concerned about.